The Canadian Naval Memorial Trust’s vision is of a nationally embraced Canadian Naval Memorial. A testament to those who served at sea in the past, and an inspiration to their successors. The Memorial is embodied in HMCS Sackville, a living symbol of the trials and triumphs of a decisive victory. They are an organization within the Canadian Military whose purpose is to maintain the remembrance of those who have served by acquiring, restoring and maintaining artifacts relevant to the existence of the Canadian military and those who served. 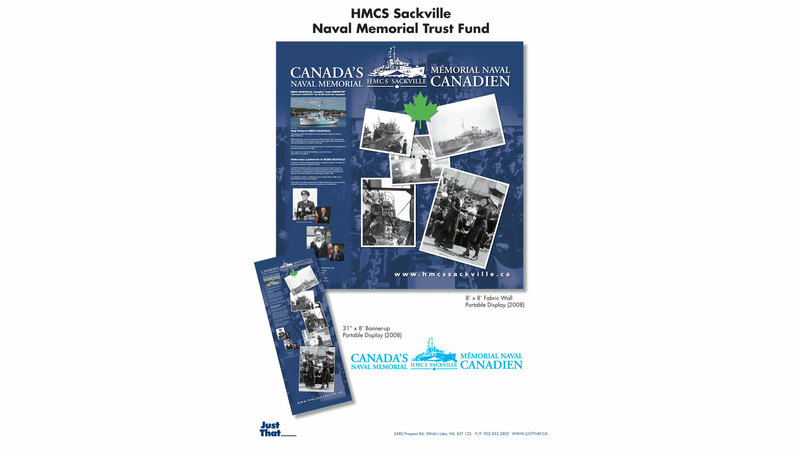 The HMCS Sackville, their symbol, is the last of it’s kind and is the focus of their attention to illustrate the need for the memorial. The task was to exemplify the essence of their vision with a number of trade show display pieces so as to attract visitors to their booth to facilitate solicitation of membership/donations to their not for profit organization. By illustrating life on the Sackville and the time in history when she also served we could entice visitors to partake in conversation and reminisce about the past and the need to preserve it.